Be sure to to say in subject line “greenhouse gallery submission.” By submitting photos and/or stories you are agreeing to allow greenhousegarden.com to use these submissions on this web site and you further waive all rights to them. There are no guarantees that your submission will get in, but most get it. Read on . 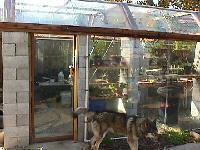 . .
Greenhouse made from cooler doors! Fifteen year-old starts from scratch! 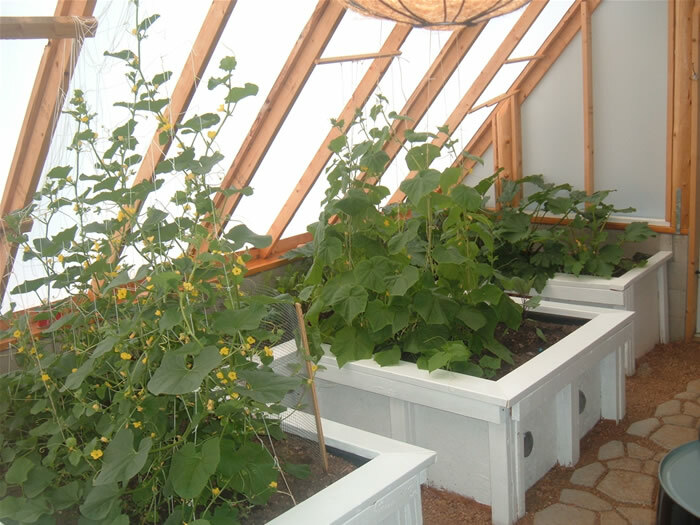 Read about an incredible high altitude greenhouse that really produces! Here’s a couple of photos from the beginnings of the greenhouse construction. My boyfriend Chuck keeps saying we should write an article about it to get published in Mother Earth News or something–but who’s got the time when there are seeds to sow and potting soil to mix!?! What we’re hoping to do this coming summer is to put up a hoop house over the current large outdoor garden to get some season extension going. The cloches I tried last fall just couldn’t withstand a hard Minnesota cold snap and wind in December. Currently, I can supply 10 CSA share members with weekly deliveries through the winter and we want to get it up to 16 next year. I think we can do it. Our greenhouse came about because we wanted a better cold frame to harden off plants started in our basement. 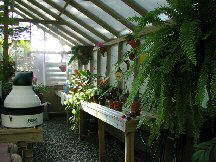 Well it soon became a true greenhouse even able to contend with a portion of our cold Wisconsin winters. Shane’s book has proved invaluable in answering all of the questions, which arise when undertaking such a project. The construction took most of the previous summer. Attached to the back of our garage, standing structurally free, it measures five foot by ten foot. All of the construction was done with pressure treated wood, we would have preferred cedar, however it cost three times as much in this part of the country. Four 6” x 6” post form the corners. The post are sunk four feet and set in concrete. 4’ x 6” timbers form sole plates, which are mortised and tenoned to the 6” x 6”s. The one quarter inch tempered glass was salvaged and set in 2” x 2” pieces of wood. The horizontal space between panes was caulked, instead of using additional wood. Three thirty gallon water barrels, painted half black and half white, support the benches and provide 3 to 10 degrees of temperature buffering depending on how cold and or sunny it was the previous day. The floor was insulated with that corrugated plastic covered with pea gravel with stone pavers set where you walk. Two small circulation fans, run by timer, a 120-volt heater and a squirrel cage exhaust fan, controlled by thermostat, regulate temperatures. One section (seven panes of glass) at the peak is hinged and ready for the hydraulic opener. This February we started up and brought out various flowering annuals and later some tomatoes. Hanging baskets hung from a steel cable at the peak really took off and look terrific. We are very pleased with what spring has brought us and excited about experimenting through the summer and fall. In the end of April, it turned extremely cold and we had to run the heater almost non-stop. At the first of May, it suddenly turned 90 degrees for three straight days…it was over 100 degrees in the greenhouse. With lots of water, everything survived! At the middle of May, we couldn’t wait any longer, and we planted some of the annuals outside. Within a couple of days, we had a light frost and lost all of the tomatoes and some of the annuals. It was a sad day. Since then, however, the weather has changed dramatically and everything is looking outstanding, now! This growing season has been a wonderful challenge and a great learning experience. Thanks to Shane for responding to my questions on the message board and for such a great book with all the helpful information and ideas. We love the book and read it often. It has encouraged us to try to grow tomatoes into the late fall and we are even thinking about growing some orchids. Your book has given us the courage to experiment and we appreciate your experience and knowledge. 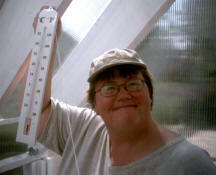 Hello Shane, I finished building this greenhouse in sept 2001. I designed it and built it myself. It took approximately 2 -3 months to complete. 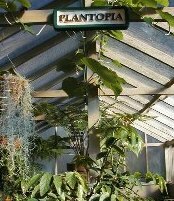 I love plants and had built a small a greenhouse about 10 years ago that cost me nearly $300.00!. This greenhouse was quite a bit more expensive, but a dream come true. It is 14×24 and contains many surprises. They say pictures are worth a thousand words, and I have hundreds of them! Please let me know what you think. Thanks, Robert”Bo” Kissinger P.S. I live in Charlotte N.C.
What seemed to be an unfinished patio cover a few years back has developed into a wonderful winter paradise for the whole family. Although it started out as a 8 by 8 little plastic and fiberglass sheathed room, it eventually developed into a 8 by 25 foot system that could be installed each fall in a weekend for about $60.00. My greenhouse is at the rear of my home on the south side, just out the basement onto the patio. We shingled the entire roof area and supported the structure with 4 by 4’s. When fall arrives each year, I screw 2 by 4’s to the posts and frame it in on 24″ center. The side wall are completely framed in and insulated on the lower portion of the wall and the top half of the walls are screwed in for easy removal in the spring. Once framed in, Nylon twine in stretched horizontally across the studs before applying 6 mil plastic so it can help control it in high winds. The twine is also applied on the outside of the plastic and stapled to the studs. I found applying the plastic on a warm day, it can be stretched pretty tight. The inside is done in the same manner thus sandwiching the 2/4 walls. My benches are scrap lumber and old pallets screwed to the 2/4 walls and supported with old 4/4’s. Inside this greenhouse sits the outside faucet, so watering is a breeze. On cold nights scrap cardboard is placed next to the walls to help reduce heat loss. I have found that roofing felt paper is a great insulator and a heat catcher. Generally the greenhouse is heated with a 8ft baseboard heater. Sometimes at night the patio door can be left open for assisted heat and provide humid heat for our home during the day. It seems to be a wonderful system and definitely a place of refuge. Sometimes fresh tomatoes can be retrieved in January when the frigid cold is mere feet away. Fifteen Year old Starts from Scratch! 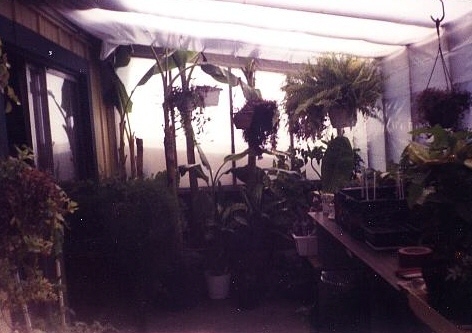 In August of 1999, I built a small greenhouse on the edge of my parents yard. At the time I was 15 years old. Now I am 17, and the greenhouse has grown with me, along with a lot of help. I owe much thanks to my neighbors who helped me along the way- they gave me construction materials, heating materials, and anything else I needed that they had to give away. I also owe a thanks to Shane- for his book and for his help. I live in a small town in northern Illinois where the weather is sometimes unpredictable. We enjoy a regular outdoor growing season, but I wanted a greenhouse because of my passion for tropical plants and fresh fruit. 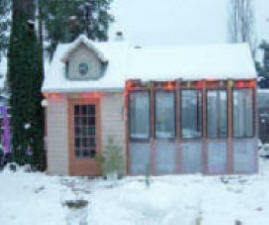 The original structure was started with old single pane storm windows and was about 5 feet square. A 6 foot square addition was added in fall. That winter, heating was unsuccessful and I put plants in the house. In spring I met Shane and he told me of the wonders of solar heat. 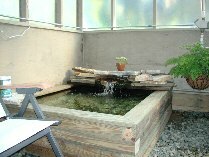 I created another addition to accompany the water and increase southern glazing. I also added a second layer of glazing and improved weather stripping. That summer, my world of tropicals opened up and soon I found I needed to increase vertical room for my bananas. The new addition used some fiberglass panels for glazing. The summer was warm but successful. That winter, a means of secondary heat became available, so I installed an old potbelly stove. In December, I was forced to construct a 3ft by 3ft section on the northeast corner when temperatures were below freezing. The next 2 days, we received a blizzard, and a day after, the coldest temperature of the season. All winter, only 1 plant, a geranium, died from cold. In spring I re-roofed my east side and enclosed my chimney, thus ending my major construction. (A small airlock is located on the west side as well.) The final building dimensions are about 8.5ft by 11ft by 10ft high. I also have approximately 300 gallons of stored water. Among my favorite plants are my strawberry and pineapple guavas, a lemon, a lime, an orange, a grapefruit, a bougainvillea, a sea onion, a purple heart, and of course, my bananas. There are also many others, including herbs, and some ornamental flowering plants. My heat is provided primarily by solar, and assisted by wood burning. I am attempting to create all of my own electricity using a photovoltaic and wind combination. For cooling, I am also going to attempt to use a small fogging unit, and an exhaust fan. Hi Shane, I really enjoy your page, I would like to share the pictures of the greenhouse I just finished a couple of months ago. 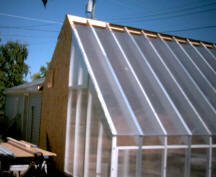 The greenhouse is free standing and built from tempered glass that was once sliding doors all over Sacramento. I don’t know if Sacramento is really the climate that needs a greenhouse, but I wanted one. My first plans were to build a 10’x 12′ greenhouse. Knowing myself and the availability of free glass, the house turned out to be 10’x 21′. This is all the room I have left in the back yard that is available to use. The glass was given to me by a local remodeler that was only interested in keeping the aluminum. The glass came in three widths, 24″, 34″and 46″, the common size is 34″ wide and all was 74″ to 76″ long. The glass size dictated the design of the greenhouse. I used the 46″ pieces for the long walls and 2, 34″ pieces and one 24″ piece for the ends. The glass was set in schedule 40 pvc pipe that I cut a slice out of. This was done so the glass would have the edges protected, as tempered glass explodes when hit on the raw edge. I considered building a pointed roof but this would have made the roof peak too high. The roof I ended up with is 10′ wide with a 76″ flat top and 34″ sides that are slanted in to make a trapezoid shape. 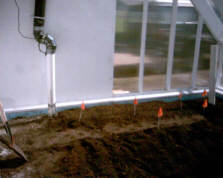 I just happened to have two pieces of 18″x 60″ glass that filled in each end of the greenhouse. With a old window sash weight and a pulley I can open each end of the greenhouse for ventilation. To support the glass and keep it up in high wind, I decided to use concrete blocks for the corners and stanchions. I filled each of these with steel and concrete. This part of the construction took the most time as I dug large footings and had to make sure everything was level and square. The blocks do block some light but they have turned out to be very handy for supporting the shelves. The center shelf is 0″ wide and 12′ long. It’s supported from the roof trusses with chains. This I did for two reasons. The first is that it gives me shaded room below the shelf that I can use for whatever without legs in the way. The other reason was to help control crawling insects. I haven’t yet decided what to grow in the greenhouse, but there’s enough planted in there now to get the warm damp smell that makes just being in there worth all the work. I have been working on my greenhouse since the beginning of August and it is nearly done. I have to share with you pictures I took of it because it is through the knowledge I acquired mainly from your book. I used some of Norm Abram’s (of THE NEW YANKEE WORK SHOP) construction ideas and adapted them to my own design. I weighed heavily the design considerations for a functioning green house set forth in your book. The location of my greenhouse is north central Massachusetts. My intention is to use it all winter (burr…………..).It is a 10 ft x 12 ft structure. I plan to incorporate the solar greenhouse philosophy because I haven’t got electricity in it yet. The materials used for the framing is 2 x 4 Mahogany. It sits upon cement block that are three feet in depth at it’s deepest point. The foundation has a footing that is 12 in x 12 in. All was manufactured from the 2 x 4’s, including the door. I don’t have solar window openers as of yet for the 10 windows but are coming. I broke ground on the first week of August and have been working on it on the weekends and after work. On October 15, 2000 I took the photos (ATTACHED) and I would like to think it is 98% finished. (except for getting some plants started). The cost to me was just under $2300.00. The labor was free. As the title suggests, it was a labor of luv. board on all sides with 2 coats. This photo was taken in around 1979. It was one of the first home solar greenhouses constructed in Cheyenne, Wyoming. It was built by my former neighbor, Isador Lopez, who was in his 70’s at the time. He had long dreamed of having his own greenhouse. After seeing how simple my solar heated greenhouse functioned, he seemed empowered. One day after cleaning out his garage and yard, Isador went to the dump with his truck full of trash and junk. After he unloaded his truck, he saw old sheets of plywood, pieces of 2×4’s, cushions from couches (for insulation), along with other potential building materials. Keen on getting himself a solar heated greenhouse he loaded his truck up with the stuff. With that, he constructed his greenhouse in only 2 days. His greenhouse grew plants right through the 20 and 30 below winter temperatures. It even heated his garage. The total cost of the greenhouse was $30.00 (1979 dollars). Even his wife was thrilled. Isador loved his greenhouse and loved to garden. He proved to me that the technology of growing food year-round can be accessible to anyone with the will to make it happen. 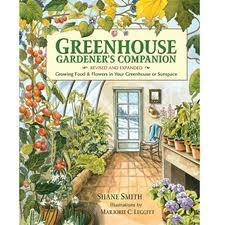 Centuries ago, early greenhouses only belonged to the rich and people of nobility. Now if you want a greenhouse, you don’t need a lot of money, special technical expertise or be a king (or queen). You can do it one way or another! Hi, I live in Illinois and the weather has been fantastic lately, a little scary though as we know we still aren’t out of Mother Nature’s winter fury. But I have been spending my early evenings in the greenhouse trying to get things prepared. The smell of the greenhouse gives me warm spring feelings as it is my favorite getaway. I love to just go in the greenhouse, sit, and piddle. What a wonderful escape from our busy lives to see all the new life growing inside, waiting to be brought out into the world. I never feel alone in my greenhouse and it is only 12′ x 18′. So, as you can see I am more than ready for spring!! Enjoy! A few weeks later . . . . . . My husband used some old windows that he salvaged from a building that was being torn down here in town. They worked out great for my South and North walls; he build this green house atop our existing concrete patio, which works out great. It is attached to my house; I can step out of my family room right into my greenhouse. I have one raised bedding area right now; but plan on installing another before next spring. 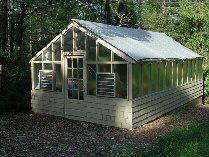 . .
My husband purchased the Gardener’s Greenhouse from the PBM Group. We are thrilled as can be with it. This is a good first step into greenhouse gardening. This four by four foot structure took my husband a day to put together and it is everything the company promised. The shelving is sturdy, I can easily access my seed trays, and the optional automatic louver works beautifully. We also purchased an optional heater for it. The company is very helpful and even sent us a replacement glass at no charge (as we broke one during assembly – expect this to happen since, if tempered glass gets bumped on the edge, it will shatter). 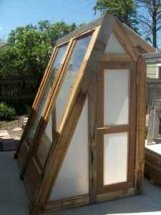 This greenhouse can sit on bare ground or you can lay brick or tile – but no permanent foundation is required. It is portable, so as our landscaping changes, we can move it about. A minimal drawback is that the instructions were slightly confusing. I think a person needs to be handy with tools and have a helper to finish assembly in one day (like we did); but once assembled, it is a great addition to the home garden.